Rook's Row Soup Kitchen - free meals every Thursday! 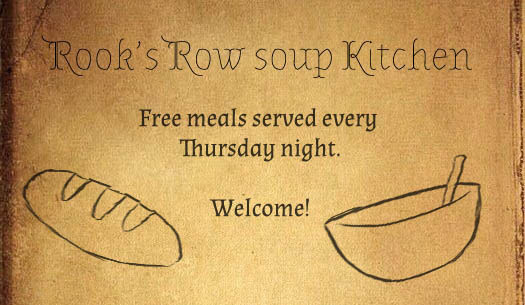 Forums » EU Events » Rook's Row Soup Kitchen - free meals every Thursday! Rook's Row soup kitchen is opening its doors for the first time tomorrow, Thursday 19th of April, at 6 PM CET, in Salma District tavern, previously known as the Merchant's Coin. The kitchen stays open until the food runs out, so come get yours! RRSP takes no responsibility for any valuables lost during your visit. Ahh, I'd pop in, my toon's food security is poor at this current time. But alas, I'm on NA, and there's no services for someone like her that she qualifies for. Her journal is behind-I'm sorry. Kitchen opens in 10 minutes. Come get some free food!